Coming in to this match, neither side is in sparkling form, but that might make for an exciting match. Covered live on ESPN and kicking off at 17:30 GMT both managers have key selection and tactical decisions that could make this a high scoring occasion. Here’s a few of those decisions analysed and dissected. The battle could be played out down the right hand side of the above image. Crucial. Ian Holloway has a fully fit squad to choose from and on the face of it he may stick with the same eleven as last time out against Stoke. Harry Redknapp is the manager with the key selection decision with his first choice at left back, Benoît Assou-Ekotto injured. Whoever Harry selects in that position will be important as Ian Holloway may try to second guess his choice and make his own selection and tactical decisions based on that. What can Redknapp do? Attacking full back – He can choose to go for Gareth Bale at left back, which gives him an attacking angle from deep, but would need responsibility from elsewhere to cover his forward runs. Regular full back – He could opt for a more defensive choice from a centre back that he has at his disposal such as Sebastien Bassong, William Gallas or Vedran Corluka, which would give his more of a flatter defensive line and less exposed down that flank when Spurs are attacking. What could Redknapp be thinking? By playing Bale at left back and advancing it gives his side greater width, however, Blackpool spread their forwards high and wide, so when Bale attacks, Blackpool may well have a player in the space waiting for the counter. Given that aspect, should he pick Bale at left back then he must be confident that either a centre back will cover, or his team can recover their overall shape before Blackpool’s threat emerges. Bale at left back is a different proposition than Bale in a left wing position and that will be something that Holloway will be aware of and part of him would most probably like to see Bale in a deeper starting position, even if he does advance when Spurs have possession. 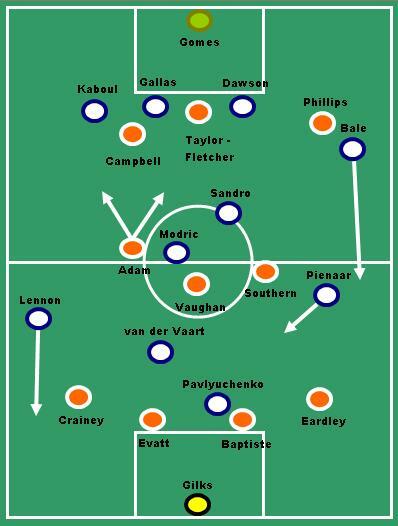 Should Bale come in at left back then Redknapp’s choice of personnel on his left wing will interesting. The selection of Steven Pienaar would make sense, the fact he cuts inside gives two benefits for Spurs. Firstly, assistance in adding numbers centrally to counter Blackpool’s possible numerical superiority given they will field a 4-3-3. Secondly, he will create the space through his movement inside for Bale to run in to and leave Bale 1 v 1 with Blackpool’s right back (Neil Eardley). Effectively this would be a good strategy for Redknapp to pursue at it achieves two key aims, restrict the time and space afforded to Blackpool’s midfield three and get Bale 1 v 1 at every possible opportunity. Should Redknapp opt for Bale at left back then that would signal his attacking intentions, however, start him on the left wing and he may well be compensating for the threat that Blackpool have as much as using Bale in his strongest position. However, assuming Bale starts at left back and pushes up as then Ian Holloway will relish the opportunities that offers. He will know that there will be left in the wake of Bale’s surges and he may well look to play Spurs on the counter and in doing so his choice of player at right forward may be crucial. In fact Holloway’s forward line is about the only selection doubt he has. In recent weeks he has opted for the trio of Matthew Phillips, Gary Taylor-Fletcher and DJ Campbell. In selecting Phillips he would be looking to use his pace on the counter to exploit the space on the right hand side. However, that recent forward selection has presented Holloway with his own issues. The trio lack a little balance. It tends to see Campbell start out on the left and Taylor-Fletcher through the middle and it gives the forward line a right-sided bias which hasn’t shown work or even be an obvious ploy. Another aspect that has shown detriment to the fielding of this trio is that both Campbell and Taylor-Flecther like to drop deep and it may be no coincidence that Blackpool’s last two performances have been very inert in the final third. Should Holloway opt for that forward line then he must have very specific instructions for them to avoid the drift to the right and deep. However, that may not be too bad in itself as it would serve two purposes. Firstly, the potential to overload and combine down the right flank. Secondly, to help build counter attacks from the deep with the forwards involved, working the ball up field. Given the second goal that Blackpool scored against Spurs at Bloomfield Road it should give Redknapp a little warning of what Holloway may be looking to do again. Finally, on the subject of Spurs’ left side, then should Bale play left wing and a more defensive option comes in, then their will still be space for Blackpool to exploit, but they may exploit it slightly differently. As Bale is advanced the Spurs full back will need to be aware of Blackpool’s midfield, possibly Keith Southern, aiming to run in to that space to set up plays. Or alternatively Blackpool may play long diagonals either over the full back or to head. Should this be the case, then Taylor-Fletcher may take up the wide right position whilst Phillips goes to the left. Blackpool will look to set up play from a Taylor-Fletcher header and advance from there. Should that be the case then Redknapp might look to field his more aerially able defender in that position. In the last match Holloway changed his midfield shape slightly to add a little more of a defensive aspect to his side setting up in a 4-1-2-3 as opposed to the 4-3-3 he is likely to play in this game. Recently Blackpool have deployed a much flatter midfield three with each player sharing responsibilities for attack and defence. This will certainly help Blackpool to gain numerical advantage over Rednapp’s preference for a 4-4-1-1, however, it might need one or more of those midfielders to pay particular attention to Rafael van der Vaart who is likely to play off either Peter Crouch or Roman Pavlyuchenko. Redknapp may spoil that battle altogether if he decides to bring in Jermaine Defoe in a two-man strike force. Should he do that then Blackpool may well enjoy some prolonged periods of possession and Spurs would look to Sandro and Modric to keep their discipline and press sensibly to disrupt the Blackpool midfield. However, should van der Vaart take to the pitch then Holloway may well ask his midfield to shape up more like the 4-1-2-3 from the Bloomfield Road match, with David Vaughan dropping in to a holding role. The Spurs left back selection may well have a critical impact on the outcome of the game. Aside from that, Blackpool won’t push their full backs up as far as they would normally do, given Spurs’ strength down the flanks. And this article hasn’t even touched on the potential impact of Aaron Lennon and how Spurs might look to get him in either a foot race or released via a pass and in behind Stephen Crainey. Also missing in this article is the crucial role of Charlie Adam, out of form of late, but will Redknapp plan to stifle him. The way that the match shapes up, he may well get plenty of space to operate in which he would relish and given his recent pep talk with Holloway then he may well form a key part of some strong passing moves in the Blackpool midfield. It would be a huge surprise if this match ends up in a dull stalemate and in fact it should be a fantastic spectacle, Holloway will go for broke hoping that next weeks match against Bolton might give his side the most realistic chance for a final three points and possible safety. Spurs on the other hand may go out with a limited but refreshing brief of ‘relax, play their own game and to express themselves’ all over the pitch. Now that their battle for fourth place is all but over then Spurs may just play without fear and they have some class acts who may well flourish under those conditions.